Although I'm trying to tidy up and sort out my studio, I couldn't resist the opportunities offered by the post-Christmas sales to further enhance my stash. 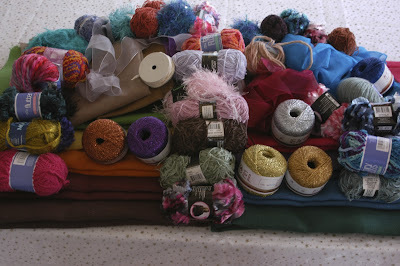 There's only about a dozen pieces of fabric, two dozen balls of yarn and a few ribbons! Lots to get started on my next project - once I finish tidying my studio!